I was supposed to give this talk today, but it got rained out. I may have the chance to give it again sometime soon, but I thought I'd post this here in case anyone is interested. The Salem Witch Trial memorial was erected in 1992 to mark the tercentenary of the witch hysteria. It was designed as the first physical structure in the city of Salem to commemorate the trials and the execution of twenty innocent people suspected of witchcraft in 1692. What a beautiful, reflective, introspective space. People often forget just how long the memorial was in coming to fruition. Historic Salem, Inc. created a committee in 1963 to commemorate what they then referred to as the Witch Delusion. The idea was that the memorial would rest on Gallows Hill, where the hangings are believed to have taken place. At that point, the Essex Institute, now part of the Peabody Essex Museum, and the Massachusetts Society for the Preservation of American Antiquities, now Historic New England, had tossed around the idea of purchasing the Gallows Hill lot on Proctor Street. They intended to erect a granite shaft to honor those who were executed. In 1963, a simple, granite obelisk was perfectly in keeping with the memorial logic of the day – it would have looked very much like a grave marker and as such was unmistakable, dignified, and reflective of famous memorials like the Washington monument. But by the early 1990s, ideas of what memorials might be had changed radically – most notably because of the Vietnam War Memorial in Washington, DC. With her design, Maya Lin, then a student at Yale, introduced a new architectural language for memorials. The Vietnam Memorial violated the conventional form for war memorials. It didn’t glorify war. It didn’t give a lot of information to the visitor, but rather let the visitor interpret the space on his or her own terms. It had a welcoming stance, meaning no matter how you felt about the Vietnam War, there was a place for you at the memorial. Designed in 1991, the Salem Witch Trials memorial itself was very cutting age – it won the design competition, edging out 245 other submissions, because it was innovative – especially in the way it used architectural language to make visible, indeed to make physical, a series of idea, of concepts, of abstractions, really. The memorial’s designers really wanted the memorial space to respond to the injustice of 1692. Artist Maggie Smith and architect Jim Cutler defined injustice in relation to the events in Salem as silence, deafness, persecution and memory. 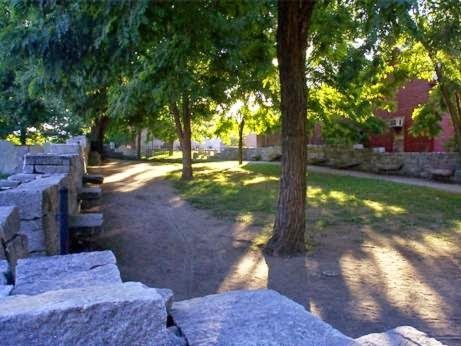 · Silence: the memorial is laid out tombs of the Old Burying Point Cemetery, where many of the accusers of 1692 are buried. Here they represent themselves - mutely watching events unfold, passively (and in some cases, not so passively) allowing injustice to occur. In our memorial here in Salem, victims and perpetrators dwell side by side, just as they did as the events unfolded. · Deafness: the protests of some of the innocent accused are etched into the granite beneath our feet. As we walk through the space, we have the opportunity to step over them, drowning out the protests, or to give them space, to “hear” them. · Persecution: The memorial space is marked by a planting of black locust trees, from which many of the convicted were believed to have been hanged. Black locusts are known to be hardy, utilitarian trees, symbolizing tenacity under adversity. They honor those who refused to plead guilty for crimes they were not guilty of, even though guilt and penitence was a certain way to avoid death. While some local experts argue that locusts never would have been able to withstand the weight of a human body, the lore remains salient and shaped the designers' intentions. · Memory: The memorial focal points are the benches on which the names, dates and methods of execution are engraved. In 1991, as in today, we live in a divided community when it comes to witchcraft. Many in Salem insist on a historical interpretation of the witch hysteria and tell us that none of the accused identified as practitioners of the pagan religion. And yet, there are members of our community who are Wiccan; they consider the denigration of witchcraft that occurs in much memorialization of 1692 an insult to their beliefs and practices, because “witch” is generally a synonym for “scapegoat” and so discourse in Salem does not broaden understanding of Wiccan tradtitions. The memorial reminds us about the consequences of intolerance. Memorials are interesting creatures. They tend to tell us a LOT more about the era in which the memorial was erected than they do about the era during which the events being memorialized took place. In this case, the language of this memorial is reflective of our times – of the late twentieth century and the early twenty-first. Fear, othering, intolerance were not unique to colonial America. Hardly. Just as an example, when Salem was accepting designs for the memorial in 1991, Charles Stuart and David Duke, for example, were two prominent names associated with fear-mongering. Both capitalized on ingrained racism in the United States. Charles Stuart manufactured a black villain as the man who car-jacked and killed his pregnant wife in a Boston neighborhood when he himself murdered her. Evangelist David Duke blamed black "welfare cheats" for the nation's economic ills. One of the questions that hangs out there for anyone visiting this memorial, standing here under the locust trees is this --- what does it mean to bear witness? As the world shrinks, as information becomes available to us instantaneously, as it is ever and ever more difficult to seclude ourselves from violence and conflict, I think -- how we bear witness becomes an ever pressing question. In a postindustrial city increasingly dependent on heritage tourism, the ways we choose to engage the memory of 1692 speaks to our own abilities to deal honestly with difficult histories. Was Salem an aberration or is it an object lesson in the ways institutions and people with power deal with uncomfortable others in their midst? Looking back just this year, architect Jim Cutler thinks that the Salem Witch Trials Memorial is his best work. "When people go there, they weep." Once we wipe away the tears, the question remains, how best shall we bear witness to injustice in our own lives, in our own communities? That’s the question the Salem Award Foundation asks and the one we all should ask, and in our own ways, answer to the best of our ability. This is one of my favourite memorials/monuments that I've seen. It's so evocative in its silence and peaceful site, carved out of the Old Burial Ground. And, during the month of October, I'm always impressed that this memorial imposes its silence on the masses of revelers and tourists in Salem. I like how you've framed this, and pointed to its place in the history of memorials, how it both recalls and surpasses Lin's Vietnam Memorial. As for David Duke, I'd call him a KKK member, personally, not just an evangelist, he was also a member of the Legislature in Louisiana and very nearly elected governor of the state. Thanks, Matthew. I love the phrase, "imposes its silence." How beautiful. And yes, to David Duke. I was trying to be, you know, tolerant. But tolerating hate got us into this mess in the first place.